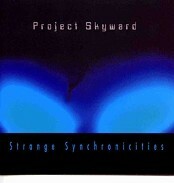 Project Skyward - "Strange Synchronicities"
Ah, Dollar-Bin Drudgery turns up some more diamonds from the rough. (There was a nice little stool as well, so I could leave the knee-pads in the car). Anyway, this is not a thoroughly innovative album, but there are some great tunes you'd be lucky to hear. Project Skyward is Ryan Skyward on vox, synth, guitar and programming, Lana Fia on Vox/synth and Ray Santiago on fx-guitar. The programmmed beats supply the backdrop to a lushly-textured space-swirl sound, ala classic Gong or Legendary Pink Dots, bordering at times on a new-agey tone. The opening track is space-blips, woosh, beat and a brooding undertone. "Distant Blue" is a gorgeously spaced love song with Lana on whispers, the wah/glissed guitars getting intensely soaring at the climax. "Afternoon in Sedona" is lovely hyper-cosmic bliss of propulsive beat, wide-open keyboard panoramas and wailing guitar meshed inseparably with the keys. Closer "Future in Our Hands" somewhat recalls Hawkwind's "Spirit of the Age". About half the tunes are merely "pleasant enough" or kinda lolling in limbo... and the lyrics are a bit quaint, but I had to bring these few special tunes to your attention. For more information you can visit the Project Skyward web site at: http://www.projectskyward.com.